1936 Pontiac Rat Rod Photo Picture Classic Cars for sale & Classifieds - Buy Sell Classic Car & Classic Truck Classifieds. 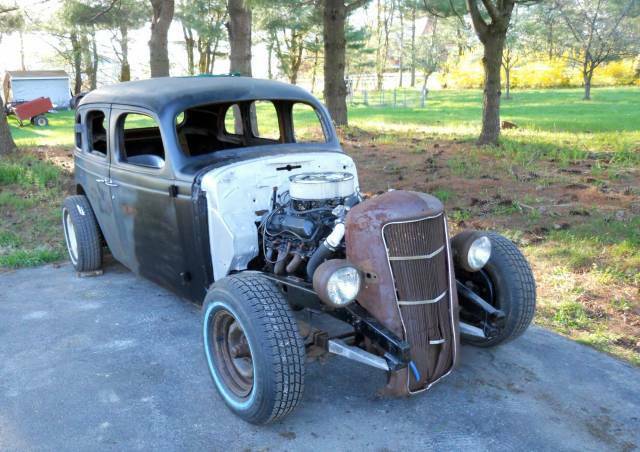 The owner of this cool '36 Pontiac has plans to finish it as a rat rod. It has a big block Olds engine, 9" Ford rear and a straight 4 inch drop axle. It's low, long and in great shape! Wondering if anyone knows anything about this car. Had a nice old 36 Ply coupe a few years way back.Thats why I guessed it a mopar grill.Think you are right in that its Dodge as they had the cross bars in part of the grill were as Ply did not.35 is not as wide as 36.Of the four mid 30s I have owned where the body mounts to the front fender is one of the first rust spots.If you run fenders its not a bad spot to fix as it does not show. It's a 35 or 36 Dodge grille. Super solid car. Looks like its ready for some TLC. I would have guessed it a 35 Ply but it may be the grill is as it looks to have been added last. Nice, very sick rat. Going to be a great cruiser, looks like it's about ready. We have a nice rat rod and trad rod scene here in Denver. Lots of us building some really neat cars.